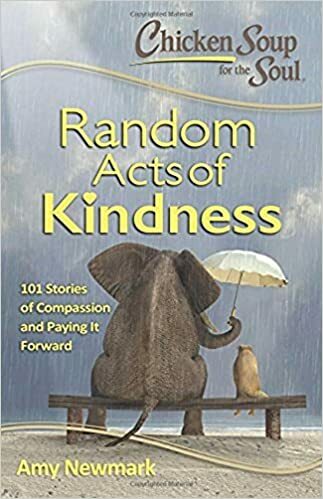 This book, Random Acts Of Kindness by Amy Newmark is a great book to read when you’re feeling nobody cares or want a great sweet dose of happiness before bedtime. I’m a huge fan of random acts of kindness and paying things forward. Greed, and the drive to gain more is at the root of most cruelty and inconsideration toward others. When we comprehend that this world is symbiotic, as we give we get, we begin to release the grip on greed and avarice. The universe is plentiful and yet so many times we live like we are grasping for the last slice of cake. There is always more cake, we just need to see the world as the mother of expansion that it truly is. Most of our abundance issues stem from childhood, from training that there isn’t enough or that you must work very hard to attain it. Back in the 50’s & 60’s there was much talk about how technology would allow folks to slim down their 8 hour work day to 4 and acquire so much more leisure time. This could have taken place but greed got in the way of it. Tesla offered us free electricity. But the governing powers in place wanted cash for this new find. Having to pay for things brings it down to the haves and the have nots which is so inherent in the way we have set up our monetary system. That being said, nothing about this is going to change, but we can adopt a kinder and more generous approach to everything we do. I believe that everything upon the earth, all creatures, contains a spirit. While we are imperfect beings, we are also filled with that same spirit. Because we are one of the few animals we know of who can reason using higher reasoning skills, make tools, and plan for our future, this means we have a higher moral responsibility to do the right thing and cause the least harm while we are here. You may read this and think I misstepped about the higher reasoning and tools or future planning that other animals exhibit? Nope. Firstly, we actually don’t know everything. We have yet to understand whale or dolphin communication, for example. As much time as we have spent studying the animals, it seems many of our takeaways are superficial and spotty. Many educated people still believe the other animals don’t have higher thought or feelings etc. Crows use tools to get at food, proof of higher thought. I have seen dogs use a tool. My brother’s dog used to put a tennis ball between his back and the couch and move so that he got a back massage. He did this repeatedly until he worked all his kinks out. Tool use. Squirrels and other animals will store food for later, proof of future planning. One animal may save another of a different species, showing compassion and moral responsibility or love. Pigs are known for protecting their human caretakers if they are treated well. A dolphin’s mate will go down with the one caught in the net, refusing to leave him/her. When they love and when they trust, they give their all. With Humans, sometimes it’s all pretending, something might be held back or change on a whim. Of course, we can also love deeply madly truly, but we employ trickery far more than the other creatures do although I know of dogs who fool the others in the pack that somebody is at the door, for example, in order to sneak and eat all the treats meant for everybody. Humans can be tricky and some of us can be quite delightful too, but with the other animals, you get what is real all the time. As Billy Joel would lament, you get honesty which here on planet human is such a lonely word. We don’t corner the market on higher thought or higher action to be sure. And where many of us have lost our way, losing it to greed and a what’s in it for me today mentality, I believe that the other animals already grasp that every action contains spirit. I try to mirror them in my actions. I work daily to be kinder and honest and to give the right spirit to others. Greed and Selfishness ruin everything, including us. I rent out a 109 year old Edwardian duplex that I have had magnificently restored. This is the kind of home you see in great shelter catalogs with fantastic bones, space and loads of light. A tenant, with whom I have been more than fair with, moved at the end of their year term and left the place in such filth it was evident they never once cleaned. Grease peeled up under my fingernails on the stone kitchen backsplash and counters …and this was after paying for 15 hours of professional cleaning! Yes the cost of cleaning will come out of the deposit but I wondered at the spirit of these individuals. Did they feel they don’t own so why bother? Were they depressed? Did they feel unworthy of such a great space that they had to trash it? Was this all somehow sticking it to the man? While it may appear on the surface of things that when we look out for just ourselves and screw the other party, that we are winning, we absolutely aren’t accomplishing a win. Acting in greed leaves the soul bereft. If all we are, in the end and all we were in the beginning, was spirit, this is a serious matter as the soul is the one thing we retain, what and who we actually are with the skin we wear simply a covering. Taming the stirrings of covetous greed can be challenging. I have a young man who calls me mom. He has cleaned up his life from drugs, and inherited a nice fortune. He is kind and helpful and giving. And so yes, there is always a hand out for the take. When he recently said no, the person asking for his money took it upon themselves to dig up online his value. All of this really doesn’t matter because fortunes change. By applying yourself and following your passions, your truth, this is how you bring home the revenue for yourself and your family. You don’t need somebody else’s. The thing is, whether it’s a Porsche or a Pinto, a mansion or a yurt, car is a car and a home is a shelter. Granted, a nicer car, one well made, is going to be a nicer experience, than something cheap and crappy. But you can buy expensive crap, see my story on my misbegotten Lexus LS600HL that my 1995 Toyota outperforms. The thing is, if the function of a thing is there, then how it looks becomes secondary. How it looks may be important to you and I will admit looks for me are absolutely a driver. But I am less caught up in the labels of things and more caught up in how I like the looks and function of a thing. Keeping up with the Joneses is unnecessary for happiness. What matters is keeping up with yourself, owning and embracing who you are and honoring this with what you surround yourself with. My father was a great businessman. He was fair-minded and kind, had a lot of friends with whom he did business who returned the favor and did business with him. He did almost all of his shopping locally from businesses who created a lot of product locally as well. He taught me by quiet example, how business and relationships work. they work best symbiotically, when we support each other by buying or trading for what we need with someone in our circle that has that item or product. 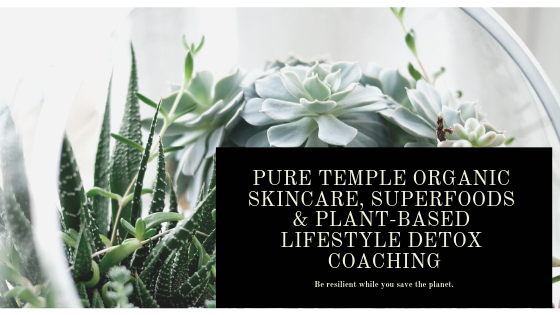 While I do a lot of online shopping, I am mindful of shopping with folks who buy organic skincare from me, read my blog or have hired me to help them move toward a Plant-Based lifestyle. By sharing each other’s talents, this is how we all succeed.